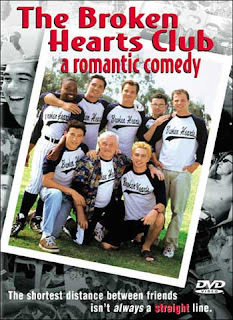 If there is a good popcorn gay film for gay friends to gather together to watch, laugh together and sulk together, it would have to be this film - The Broken Hearts Club: A Romantic Comedy. But then again, I am still puzzled with the need to identify itself as a romantic comedy in its title. This is the one film that one can catch Dean Cain (the superman, but without his red brief) in a gay role. And also a film to see the young Andrew Keegan sharing lips-to-lips kiss with Timothy Olyphant. What is pleasing about this gay themed film is that the lines were written really good, that I am amazed with the could-actually-be-happening gay events in life. Something that could have happened in any gay's life. There are so many scenes to love and to laugh in that film. I like it when more are called in to identify if Howie is gay. Or Taylor crying his heart out that there is no Barbra or Judy CD in the house where he is depressed over his ended relationship. A gem, definitely. Only wish that the ending could be happier. I am glad I found your blog. I Love it. I totally agree about this movie. I think it is really well written and totally shows that Greg Berlanti just is a great writer who only gets better. I feel you on Tori for the most part. Kiss the Bride is the one thing where she works for me. Maybe I am just happy I didnt want to shoot her for onece.